One of the first things I did when I bought my home in 2006 was to dig out the sad grass and the Concord grape vine behind the house and make a vegetable garden. It was my own private "victory garden" and I was "King of the Veggies" and rewarded for all my labors. Every summer since, I have bought seeds and starts and planted way too much, way too close together. For some reason, I always thought I needed three rows of beans, five kinds of squash, red, yellow and purple carrots and fifteen different tomato plants. I'll admit that I have too many favorite tomatoes to choose only a few. Narrowing my list down to four or five is going to be hard. I was growing far more than I could ever use, or give away. At a certain point in the summer, you can no longer give away zucchini. NOBODY wants them! Amazing heirloom tomatoes are much easier to give away however. What I found out about planting so much - it's a lot of work, time, and water! More importantly, I need to take it easier in the future.Which brings me to my patio plan! Since my yard doesn't have a deck or patio, I have been using the driveway for this purpose. It's not ideal or very private, but it has worked. Fourth of July bbq-ing and eating dinner on your driveway feels a little odd at times. Especially when you have "bad" neighbors, like the one we unaffectionately call "Hell Harpy". Driveway dining - the view of the water lilies is good! Hi Mom! This year, I decided to stop feeding the world and turn the existing veggie garden into a patio area. The location behind the house makes it more private and quiet. The estimates I asked for from different landscape companies came in anywhere from $2,200 to $10,000 depending on the materials used. One of them had to include a line item for fixing the lawn after they ran over the grass with a backhoe. I didn't like the sound of that. So, I decided to try to do it myself. While I'm not very skilled at most things, I figured I could shlep gravel and sand and rake it level. I'm doing this project on a budget, so it won't be perfect, but it will be my handiwork. While I have been thinking of doing this for a while, the first step was heading to my local big box store and picking out some pavers. I didn't want them to be too cheap or too expensive and they had to look decent. I preferred a larger size for the bulk of the patio, but having a mix of sizes in the pattern was a plus. The pavers are a concrete mix, sized 8"x16", 16"x16" and 32"x16". Since they are from the big box store I can easily buy a few more if expansion is needed or if I break one. The overall size is approximately 10'x18' so far. I began with a trunk load of pavers and started to throw them over the bare dirt to get a feel for them and what I could do with the design. A total of five trips over a few weekends was needed to get everything I needed. Laying out the pattern over existing bare dirt. I'll admit that buying and transporting them myself was a bit of a b! @#h.One of the trips, I had to go all the way to Sherwood, as that location was the only store in the entire Portland metro area had the small paver I selected. It's hard to lay out your pattern with only 2 of the 3 sizes needed. So off to Sherwood I went. Some of the area next to the patio will be new flowerbeds, continuing the theme of the rest of the garden. At the north end will be an area that I will bark over and move some of the "ponds" from the front yard. The area I created last year to accommodate new water lilies will then be available for more peonies!!! Since I love sitting and watching the fish, this will be perfect. I had to move the table to see how it would fit and get a sense of the scale. Water lilies in the front left dirt patch, tomatoes in the back. The pile of wood is going. Part of doing this project myself is so that I can also afford to replace the sad aluminum shed. So just imagine a lovely new shed painted white with green trim to match the house. 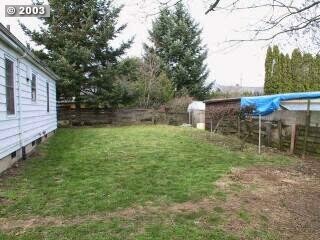 Next to the shed will be enough area for me to plant a few tomatoes and a few hot peppers. This layout also allowed me to save the asparagus I planted seven years ago. I know it was silly to try to save it, but just had to. This layout also meant that I didn't have to remove the "L" shaped sod. I just love removing sod! The next step is to buy gravel and sand and have it delivered to lay the pavers properly. I'll carefully remove and stack the pavers to make them easier to lay down when ready. I'll wait a few weeks for some warmer, dry weather. I'm looking forward to many summer nights on the new patio. Stay tuned for Part Two! I am so excited you are doing this! Poor Hell Harpy, he's going to miss the opportunity to chat at you over the fence. Hell Harpy is the ex-girlfriend/baby mamma of the guy next door - She screams everything! How cool that you're doing this yourself! I know you'll enjoy your new patio area immensely! I figure if I can't haul sand and gravel and rake it flat, I should probably give up gardening. Hopefully I can get it done right. Wow! Big project, can't wait to see how it turns out. I'm very excited about the project and my new opportunity to buy more peonies. Ah, big fun and even bigger reward when your done! Can't wait to see the progress. The more I think about it and how the are will be laid out, I think it will be perfect. I'm very excited about the project. Excitement can carry you through a lot of blood & sweat (hopefully, no tears). It's going to be grand, and DIY is always better than ready-made. Ah, this is going to be so fabulous! No deer in your neighborhood? New to Oregon and trying to figure out what I can plant in a new yard ravaged by deer on a regular basis! Your patio is going to look great! The Peonies Say "Winter's Over!"